Akaiberry was a raffle kid at the ADGA National show in 2012 and was 4th place Junior Kid. Called "The Sable", on our farm because she looks like an alpine, stuck around all winter and developed into a beautiful doe. She was the Junior National Champion in 2013, as well as being 1x Reserve, 5x Grand, and one time Best Doe in Show as a dry yearling. In 2014, she freshened with a BEAUTIFUL udder. She finished her championship the first weekend out. She continued on her ways where she stood 1st Place 2 Year Old, and was NATIONAL CHAMPION! After the Nationals, she has done very well competing in mostly the AOP Division, and has been 5xGCH, 6xBOB. In 2015, Akaiberry picked up where she left off in 2014, even after only having a single. She was 7xBOB and 4xBDIS this season. Akaiberry continues to look better and better each year. We would like to thank Bob and Elsie Hausman from JOASH Sables for donating such a beautiful kid for the raffle. We look forward to beginning our own Sable line with such a wonderful foundation animal. After giving us two daughters this year, one who was National Junior Champion, Akiaberry has decided to take the year off from being bred. We will try again next fall. 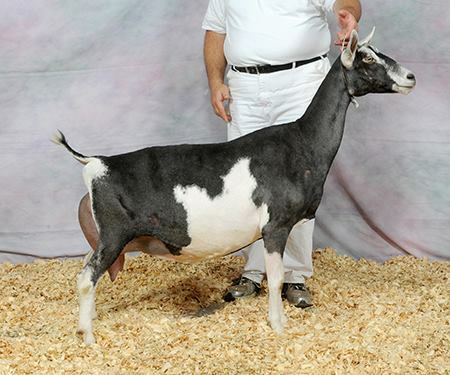 We purchased Huldah at the 2014 ADGA National Show after we decided to breed Sables. To us, she was the right kind of goat - tall and long with incredibly strong feet and legs. In 2015, she was 6x GCH and 3xBJDIS. As a first freshening 2 Year Old, Huldah did not disappoint us. She is both a milk doe and a show doe. At her first show she was 2x2nd, 1xRGCH at the Boone Companion Show in Missouri. At the 2016 ADGA National Show, she shocked us all going 1st Place 2 Year Old with 1st Place Udder, and then being asked to milk out for Best Udder of Breed! What a honor for a first freshening 2 Year Old!! As a 3 Year Old, Huldah continues to be a standout. She may have been slowed down after an injury to her face as a 3 Year Old, however she bounced back to finish her championship after surgery AND was named National Championship at the ADGA National Show in 2017! Huldah continued to excel in the milk pail as well finishing in the Top 10 for all three categories in both 2016 and 2017. 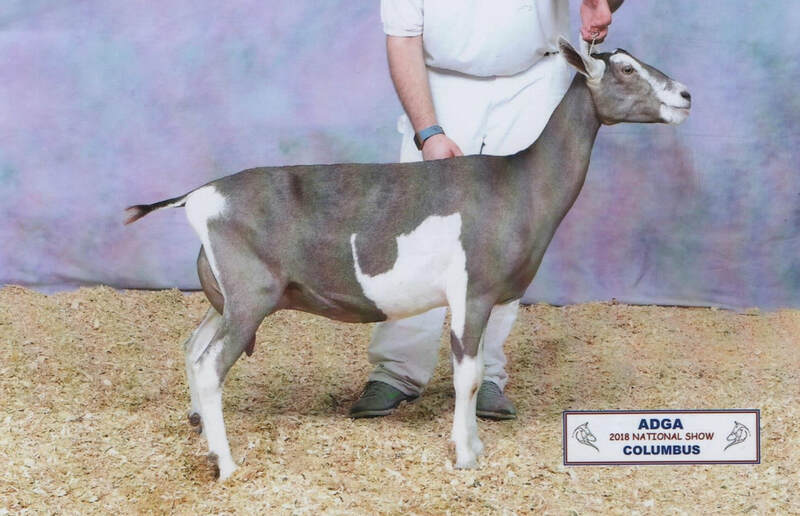 She has three sons in herds across the nation, as well as her daughter was the 2018 ADGA Junior National Champion- Koalah! Huldah continues to showcase why she is a cornerstone of our Sable breeding program. We will repeat the breeding to see if we can create another Koalah in 2019. Cameron picked out Roseberry's dam, Grapeberry, after the 2012 Nationals when he showed her. She has a great personality and appears as if she will be slow maturing. She may a bit slow maturing, however Roseberry was 2xRGCH and 1xGCH this year. Roseberry has alwasy seemed to place behind the other two does we own in this age division, however is she's pretty strong doe in her own right. Her weight in the showring is overshadowed as her ability to reproduce is what makes her so strong. 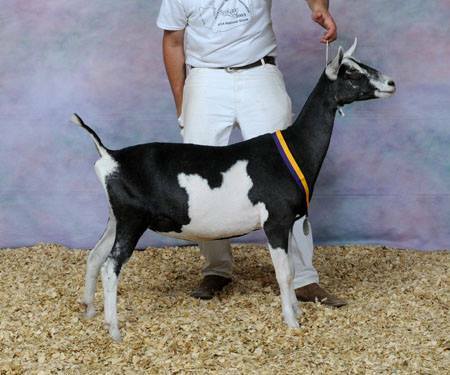 She has produced quality doe kids throughout the years, including two does who have topped the class at Nationals. We really like her doe kid Hukleberry, and think she will outstanding in 2018. Her 2017 daughter, Jadeberry, was sold in the 2018 Colorama Sale to the herd of Joe Brown in MO. We look forward to seeing what exciting kids she will produce in 2018 sired by Oden March on Selma. ﻿We purchased Mocha have a maternal sister to Akaiberry. When we got Mocha here we were elated with how beautiful she was. She has a beautiful profile and even a better personality. 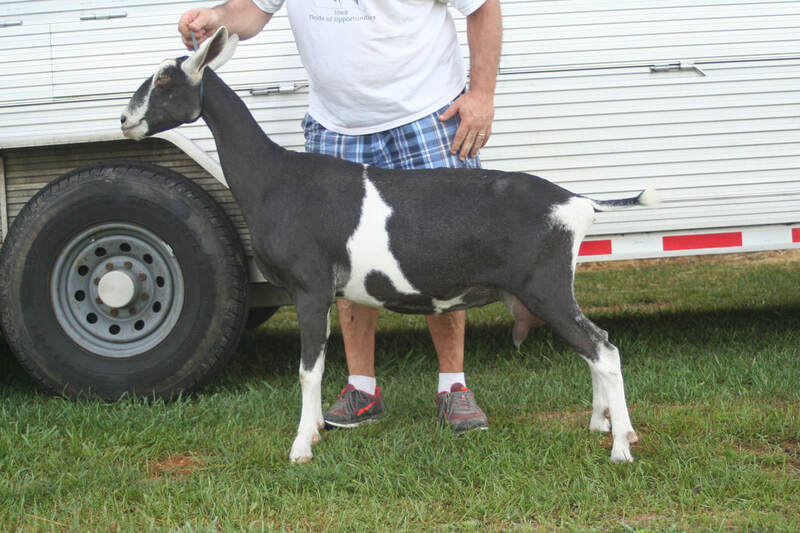 We have high hopes for this one, and we were not disappointed as in the show ring. She was 9x1st, 3xRGCH, and 1xGCH; earning her dry leg as a kid. When Mochaberry freshened, she did not disappoint us. She was both a strong milker and show doe. At the 2016 ADGA National Show, she was 1st Place, 1st Udder Yearling Milker as well as teamed up with her sister Akaiberry to win the Produce of Dam class! 2017 was a rough year for Mocha - she freshened a bit uneven and had a bout with enterotoxemia in which we nearly lost her. By the end of the season she was looking much better. She rebounded quite nicely to place 2nd in her class as a 3 Year Old, and appraised the highest out of all of our sables at FS 91! We will continue to love her look in side profile, and look forward to another doe kid as we LOVE her 2018 doe kid sired by Oden March On Selma. Mochaberry is getting AI-ed to Pindell's ONF Road Base to create a cool breeding for 2019. We brought in "Hunny" in 2016 to round out our core of original does. We admired her dam's depth of body and general appearance traits. Originally, we had no intent of purchasing a doe, however we are happy to add her to our sable herd. After owning her for nearly half year, all I have to say about this doe is "Oh Hunny". Hunny's personality is what makes her a farm favorite. As a kid, she was 1xGCH, 1xBJDIS over tough Sable and Midwest competition. In 2016, she finished with 6xGCH, 2xBDIS against tough competition throughout the Midwest and placing 2nd at the ADGA National Show. In 2017, she freshened with AN AWESOME udder! She easily finished her championship at the Illini Interstate Showdown and is milking 13 lb a day! She continued to excel placing 1st Place, 1st Place Udder at the 2017 National Show. 2018 started off on a rough note for Hunny- she aborted very late into her pregnancy and we decided to bring her into milk. Nonetheless, she topped her class at the National Show and was named 2018 ADGA National Champion! We absolutely love everything about this doe and look forward to retaining her 2019 buck kid for our junior herdsire out of Jen-Ma-Ka Smooth Criminal. Haliberry as a yearling milker, milking only one side due to matitsis. Halliberry was the 2016 ADGA Junior National Champion, 1st Place Senior Kid, member of the first place Best 3 Juniors. She is a taller version of her dam. When she freshened we were quite pleased with her overall mammary system as well as her overall production. However, she developed a nasty bout with mastitis and nearly dried up on her left side. The majority of her production record was from half an udder. She came into milk on both sides of the udder in 2018, and put it all in the pail and in the ring. She was 1st/ 1st Udder 2 Yr Old at the National Show and teamed up with her sister to win the Produce of Dam Class. Hali is a doe that oozes dairy-ness, and again we look forward to another freshening from her. We also can't wait to repeat the breeding of Haliberry to Joash PBB Dutch Chocolate for a repeat breeding of this year's Reserve Jr National Champion. Huklberry as an Int. Kid. Hukleberry has always been one of the most correct does on the farm since she was a kid. This correctness has helped her place 2nd (Int Kid), 1st (Sr Dry Yearling), and 2nd (2 Yr Old) at all three ADGA National Shows she has attended. She has a great feet and legs as well as mammary system that is only going to get better as she ages. She currently has two legs towards her championship, and we look forward to her second lactation in 2019. Hukleberry is planned to be bred to Oden March on Selma. Jakiaberry has been special since the day she was born, even though we thought she was a buck at first glance! 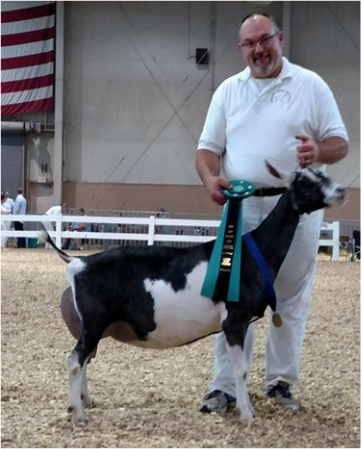 She is the type of dairy goat we are striving to breed for with her overall general correctness, strength of bone, and angulation. She was named Junior National Champion in 2017 and won numerous GCHs and BJDISs as a kid. She freshened with a superbly attached mammary system in 2018. She was 2nd place at the ADGA National Show, and was first at all of the local shows we go to except 1. We look forward to seeing more capacity of the mammary system with another freshening in 2019. She is being AI-ed to Klisse's Masterpiece of Hope or being naturally serviced by Jen-Mae-Ka Smooth Criminal. Jenah is a doe that really combines a lot of aspects of her dam and her sire. She has beautiful dairyness combined with good size and length. Jenah is the twin to our 2017 Spotlight Sale Doe. Jenah freshened and she screams- MILK!! She is one of the highest producing does in the herd as yearling, and is projected to milk over 3000 lb AS A YEARLING! We believe with another freshening she will grow into her body and her mammary system a little more. She did team up with her dam to place 2nd in the Dam & Daughter class at the 2018 National Show. Jenah is getting bred to Oden March on Selma.